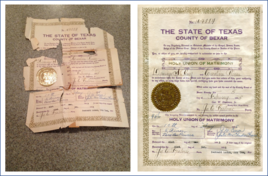 "...I thought I was asking for a miracle..."
I want to acknowledge the remarkable job you did in reconstructing my parent’s marriage certificate. Frankly, I thought I was asking for a miracle due to the fact the 1935 document had not seen the light of day since it was place in an envelope in the 1950s. To think those scraps of paper I handed over to you are the same beautifully restored item you returned to me. "I've been very pleased with the process and results." 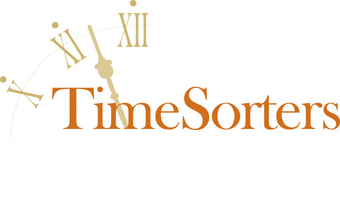 "I met Terri at a seminar she gave on preserving documents. I brought an 1824 Marriage Certificate which had begun to deteriorate. Terri was just great explaining what could be done to stabilize the document for safe keeping, and to digitalize the document for display. I've been very pleased with the process and results." "...my aunt was DELIGHTED with the copy of the scrapbook. It exceeded her expectations, and she began reading in it as if for the first time." "A Unique and wonderful gift"
What a unique and wonderful gift to have a piece of my family history beautifully preserved. Thank you! "Terri made us feel comfortable..."
securing them for future generations to enjoy. And the odd-shaped display box looks wonderful! "Talk with [Terri] about the ”stuff” you need to deal with and I think you will like the result"
We are a local history organization making the transition from neighbors preserving “stuff” for posterity to opening an office where interested people can visit to access the saved materials. We have benefited greatly from Terri’s expertise and experience as the work to catalog our saved materials progresses. By happy coincidence we received a couple of large collections about the time Terri arrived. These contained a variety of paper and object materials to be evaluated, grouped, appropriately stored and cataloged. Terri did this organizational work which will also serve as an example we can follow. Many of her volunteer hours went toward digitizing collections of photos, slides and negatives which will allow public access to favorite images. Terri is quite a good listener as well as an expert. She helps us achieve our goals. Talk with her about the ”stuff” you need to deal with and I think you will like the result. The thumb drive arrived today with all my photos – PERFECT! Terri is a highly skilled professional with expertise in artifact and archival preservation. Her experience and keen attention to detail, coupled with her integrity and ethics, ensures that she treats every item as though it were her own. I am very impressed with her work and highly recommend her. "...honors my dad's memory and is displayed for all of our family to enjoy." I felt terrible that my dad's WWII medals were tucked away in a box inside a plastic bag in my closet along with a naval service card that had not been properly stored ad was missing a sizeable piece. Through Terri's research she was able to find a replica of the card and filled in the space that was missing. After adding a photo and his dog tags, she carefully created a beautiful shadow box that honors my dad's memory and is displayed for all of our family to enjoy.